Each of these fruits is packed with nutrients and fiber. And while they’re sweet enough to taste like a treat, they won’t trigger sugar cravings. Is your favorite on our list? “They’re sweet, juicy, flavorful, and bursting with fiber and plant nutrients,” says Anna Taylor, MS, RD, LD. “Blueberries are particularly high in antioxidants that protect your cells from free radical damage. In fact, blueberries rank high on the American Institute for Cancer Research’s list of Foods that Fight Cancer. Some research even suggests blueberries may help reduce age-related memory loss. “What’s not to love? I sprinkle them on everything – yogurt, oatmeal, salads,” she says. Here’s how to enjoy blueberries all year, at a fraction of off-season prices. Buy them in bulk in the summer, when they’re cheapest and most flavorful, she advises. Then wash, dry and store them in plastic zipper bags in the freezer. 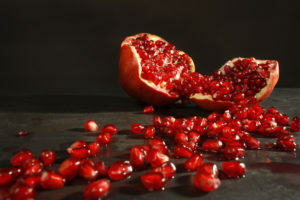 “Pomegranate seeds may be tiny, but don’t let their size fool you,” says Brigid Titgemeier, MS, RDN, LD. The small seeds are filled with some of the most powerful plant-based nutrients (polyphenols) that help decrease oxidative stress and inflammation. Research also links antioxidant compounds in pomegranate seeds (ellagic acid and anthocyanins) to lower blood pressure and cholesterol levels. 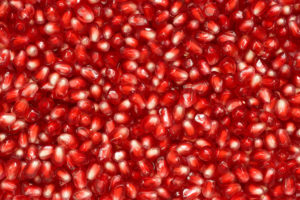 One-half cup of pomegranate seeds contain 72 calories, 3.5 grams of fiber and 12 grams of sugar. Raspberries are full of plant nutrients called polyphenols that decrease oxidative damage. One cup of fresh raspberries provides 65 calories, 8 grams of fiber and 5.4 grams of natural sugar. Oranges are packed with vitamin C and potassium. They also contain flavonoids, plant nutrients with anti-inflammatory properties. Eating an orange is better than drinking its juice. You get 3 grams of fiber in an orange, which has 69 calories and 12 grams of natural sugar. Apples are packed with antioxidant plant nutrients, and vitamins A and C. “They have also been shown to help lower cholesterol due to their high soluble fiber content,” she says. Watch the size, however: very large apples at your local market may be 200 calories. One medium apple, with skin, has just 95 calories, 4 grams of fiber and 19 grams of natural sugar. If you’re snacking on an apple, pair it with natural peanut butter to get a little protein, suggests Ms. Kirkpatrick. We all need to eat two servings of fruit every day. So why not choose fruits with the biggest nutritional bang for your buck?